This is the first book in the new oil-rich MacFarland series, which will be part of my Brides and Billionaires series. 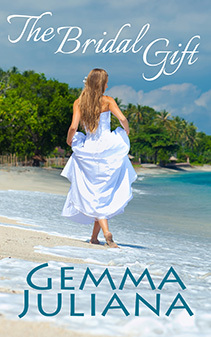 The last thing Arabella Weston expected when she moved to the tropical island of St. Avila was to be dumped by her fiance for an older, married woman. That’s just the beginning. Arabella discovers her philandering ex-boyfriend has not paid the loan on her dive boat for months, and the bank is about to take away her livelihood and home. Travis MacFarland is a billionaire Texas oilman who retreated to the island of St. Avila to try to overcome an embarrassing phobia. How can a man of the world who has it all be afraid of the water? What he needs is someone to help him heal the pain of his past so he can move beyond his fear. When Travis sets eyes on Arabella one dawn morning, he believes he has found the solution to his problems, but neither of them is prepared for the chemistry that sizzles when they come together. Will Travis help Arabella save her dive boat, and if so, what price will he exact from her in return? Follow me on Twitter to be notified when The Bridal Gift is released!